Hurricanes are strong storms that can be life-threatening as well as cause serious hazards such as flooding, storm surge, high winds and tornadoes. With the threat of Hurricane Florence greatly impacting North Carolina, it is important that we keep our homes and families safe. 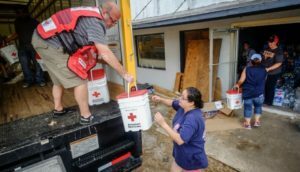 TradeMark Properties’ Executive Vice President, Jim Harris, serves on the board of The American Red Cross of Eastern North Carolina and has shared ways to keep your family and home safe and how to get involved to help those that have been effected by the storm.